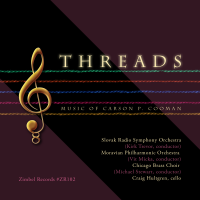 Threads: Concerto for Orchestra (2003) was commissioned by the Harvard Club of Rochester for Ken Brown and the Fairport High School Orchestra. The work is dedicated to Ken Brown, the orchestra, and in memory of Frank E. Cooman and John G. Pierce. It is in three movements. The first movement, Intrada-Chorale, is driving—exploring the melodic and harmonic potential of a simple motive that opens the movement. Two different modal, chorale-like themes appear as the movement pushes towards a forceful conclusion. The second movement, Nocturne (Beacon Hill at Night), was inspired by walks at night (especially after the rain) in the historic Beacon Hill district of Boston, Massachusetts. The movement features a solo cello. It begins with a cello soliloquy, unaccompanied—perhaps representing the walkers at night. A series of upward moving chords in the winds enter over a bed of strings. A cantabile melody is then presented. From this emerges a radiant (hushed) string chord under which brief two solos (for bassoon and tuba) are played. The final ethereal ending quotes the opening of the movement again (as the cello solo returns) before dying away to nothing. The third movement, Patterns, is energetic. The movement is constructed from a series of patterns which appear, are repeated, and sometimes overlap. A sprightly, bouncing tune serves as the principal material of the movement. A contrasting middle section develops a lyric melody over an accompaniment. The final section brings back the patterns from the opening and combines them with material of the middle section before an excited coda closes the work.